This unique book addresses the under-analyzed subject of internal migration in American historiography by showing the impact of eight generations of a family from New England on the development of Southern Georgia from the eighteenth to the end of the twentieth centuries. Focusing on cross-regional influences, The Tifts of Georgia sheds new light on such traditional topics as paternalism, cultural assimilation, and race relations. Originally from Mystic, Connecticut, the Tifts migrated to Key West, Florida, where they profited from the wrecking trade, set up business operations at various points along the eastern coast of the United States, and eventually made a significant impact on some of the less-developed areas of Georgia. The most important member of the family was Nelson Tift, a pioneer businessman who founded the city of Albany, Georgia, in the 1830s and played a major role on behalf of his adopted state during the Civil War and Reconstruction. His enterprises were often coordinated with his brother Asa in Key West. Their nephew, Henry Harding Tift, founded Tifton and Tift County, and Tift College in Forsyth was named for Henry’s wife, Bessie, a major benefactor. Later Tifts were not only involved in the continued development of Albany and Tifton but made significant contributions to the economy and civic life of Macon, Atlanta, and other communities. 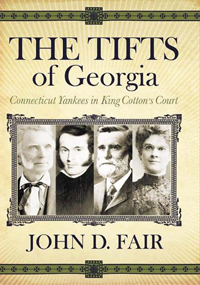 The Tifts brought Connecticut Yankee values to the South but were in turn transformed into Southerners. The Tifts of Georgia is richly illustrated with charts, maps, and original photographs. This history of an important Georgia family should be of special interest to professional and amateur historians, sociologists, cultural anthropologists, and genealogists.